Let us pray for one another. We come from all walks of life, and deal with so many contradictions daily. Many times we desire someone to talk to, someone to pray with, someone to pray for us, and we find ourselves alone – humanly speaking. This page has been established for those who desire to have the people of God pray for them. In spite of the negativity surrounding the Christian church, there are true believers who God listens to, and answers their prayers. There may be delays, there may be a “No,” or a “Not now,” or no answer at all when you want it. Learn patience. The point is we need to raise our voices for our world, especially those who are hurting. Please feel free to leave a prayer request, and you may do so anonymously. It is one thing to post a comment, and another to specifically ask for the prayers of praying saints. Be specific about what you ask of God, but remember – He already knows what you need – He is just waiting for you to ask. 26Then came the word of the LORD unto Jeremiah, saying, 27Behold, I am the LORD, the God of all flesh: is there any thing too hard for me? 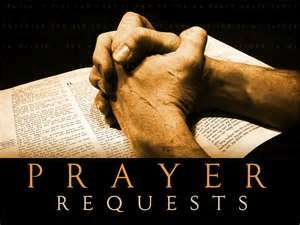 NOTE: This page is for prayer requests only. We will pray together and for one another, but we will not provide any responses, we will leave answers to God. Therefore, any responses to a prayer request will be deleted. 7Ask, and it shall be given you; seek, and ye shall find; knock, and it shall be opened unto you: 8For every one that asketh receiveth; and he that seeketh findeth; and to him that knocketh it shall be opened. 9Or what man is there of you, whom if his son ask bread, will he give him a stone? 10Or if he ask a fish, will he give him a serpent? 11If ye then, being evil, know how to give good gifts unto your children, how much more shall your Father which is in heaven give good things to them that ask him? I humbly request prayer to stay strong. Fighting the “Good fight of faith” gets heavy sometimes. Daily strength is much needed to stand tall in the face of adversity. When all seems dark and confusing, I pray that God will help me to understand that He is still with me. When friends and family forsake me, dear Lord, help me to remain faithful. When the enemy assaults by your permission, help me to see beyond the pain; help me to see the end results, help me to carry on when I am weak. Saints, please pray for me during this heavy season of darkness. Thank you. Please pray for me and my daughter in respect to protection from domestic violence. I am fed up of suffering and no money to divorce him earliest. Thank you for praying and support. I have been in an abusive relationship before and I healed completely. However, after years of dating and helping others and forgiving I have recently been stuck in an abusive relationship because I missed some signs. I was duped and to my own undoing I believed he was good for me. I tried to break free for 6 months while people just watched and were used as his pawns. Long story short I started talking and speaking the truth of what was happening to me. NOW he is in the church I attend. He mocked me for this and I finally quit responding to him period. He yells, He tells me I am nothing without him, He says I will never make it without him because of my disability with my back…I am limited in physical ways but not enough to not fight back. I am still not responding After 100s of harassing texts and phone calls, and let’s face it a restraining order doesn’t do anything except anger a psycho worse after he gets out of jail from breaking it. This guy will not leave me alone and is claiming he said YES TO JESUS. Good for him. The thing that sickens me is even with all the proof I have of his psychosis via texts, pictures and unwanted hallmark cards and gifts that keep arriving at my house I hear “But he said YES TO JESUS” That is between him and God and I believe this is just a mask to undo my peace and stalk me further, the body is letting him in the doors. He is a MASTER MANIPULATOR and I am afraid. It makes me sick that my own family is so foolish to think that I must be the martyr here. My mom coldly says to me. “Do what you want to do when I tell her I am finding another church.” This guy has pointed a gun to me and to his own head. He has held me for hostage in his house. Honestly I welcome the day just wake up in Heaven and in Jesus arms but that is not what this life is intended to be. I WANT HIM TO BE GONE TO ANOTHER CHURCH if he is truly transformed. He claims he use to go elsewhere….so now that I refuse to even respond to all of his harassing texts and phone calls he shows up at mine. Well the answer is obvious. I have a big problem on my hands and a jaded group of church and family members in the name of Jesus. He contacted my 16 yr old daughter last week and I nearly lost it. I told him over 6 months ago he is to never speak to me or the women in my family. He stands there and stares at my mother as she checks in children. She blames me for the crap that I let into my life and now i am a burden to her as well. She has no idea what it is like to be a single woman in this world with the devil at your door and is quite the stumbling block to me.I am dealing with a lot of stress that is causing bad health, no sleep, poor performance at work and it is causing stress in my family that is causing division because nobody has the back bone to face him. I am sick from this and just don’t even want to leave my house. Feeling trapped and afraid. Feeling like people have turned into chickens in the name of Jesus. Jesus was not a wimp and would never tolerate this towards anybody. I need prayer please. I need deliverance. I am trusting and obeying but feeling like this may be the most foolish thing I ever did by not leaving my current church as it is not safe. The crazy thing is for the first time in my life I felt like I was in a safe place of worship and all this started happening. He never attended church with me. I always went by myself. Now he stalks me there acting like an angel of light. Feeling hopeless and damned. Please keep me in your prayers. This has been the worst experience of my life. He belongs to a certain organizations that enable the stalking to continue. I pray and call daystar minitstries daily. I heard he made this guy get me pregnant from my sister who wont say to much. Her and her husband had an incodent where their hood of their car was unlatched and the hood came open on the freeway. And has been intimidating my whole family. I have no concrete evidence to take to the police. This man has left my family a complete mess. In one conversation He said it was Gods will that we be together. We can’t even go to the police.I’m trusting God to end this permanently. I hope does nt do this to another person. I feel very lost and unhappy, please help me, I’m hurt inside, i am so tired to cover everything by pretending and no matter how hard I pray nothing seems to be working, please pray for Damianus aditya christie and me. I have been waiting for reconciliation and peace for me and him, everyone tells me to forget and leave it, they keep pressing me. I cried, it’s not so easily as they say and imagine. i feel so traumatized, I have been struggling with depressed and suffering for the past 3 years. I know You knows my pain God, You always know what was happened because You see everything a most hidden corner, Father you say, ask and it will be given to you; seek and you will find; knock and the door will be opened to you. I come with a broken heart, i depend on you and still hope, if God deign, please God soften and touch Damianus aditya christie heart for me. I can’t touch his heart, only God can change people’s hearts. please help me face things that are beyond my capabilities. because God, You have power to help me.